Ever since its foundation, numerous articles about prize winning of UNIST Rowing Club have been published on UNIST News Letter every semester. How could they accomplish those outstanding outcomes? UNIST journal has experienced Rowing Club’s life for two weeks to find it out. We have participated in the weekday training session with UNIST rowing club. The training starts at 8 p.m. with running around the UNIST once. The running pace was quite fast, so we all were surprised. The length of the running track was about 1.5 kilometer, as a circumference of our school, and as we reached about half the total course, we started to huff and puff. The interesting thing was that all t members of the rowing club who participated in the training ran with the same speed and no one had fallen behind during the running. After running, we did some stretching before the real workout. The strength exercise began in the room of the UNIST rowing club located in the Sports Center. The workout consisted of squat, abs workouts, push-ups, and some others. Even though most trainings were not using weights, the repetition made it difficult for us. The purpose of the training seemed to be focused on the muscular strength and endurance that are vital to rowing. After the exercise, we tried the rowing machine, also known as the ergometers, which is suitable for one man to practice rowing alone. Much stamina was required to practice with the machine, and it also required muscle endurance and explosive power. As we rode it, we soon got worn out. This was all the weekday training of UNIST and they have it every day. We thought this training is what makes the members of the club stay fit all the time. We also participated in the weekend training session. The UNIST rowing club now owns 6 rowing boats in a place nearby the Taehwa River where they can actually row on water. The rowing club members move the rowing boats out of the storage, put them on water, and ride in them. The actual rowing is much different from exercising with the rowing machine. When people ride on the boat and row, they need to control their rows individually in a shaky boat. Besides, everyone should be attuned to each other so that the boat can go straight in the right direction. To communicate, the person at the very back of the boat called ‘cox’ keeps telling the rowers what to do. When the rowers are ready, the director or a referee shouts out “Ready, Attention!” and blows a whistle. Then the cox shouts as “Row!” and the boat starts moving forward. All members on the boat simultaneously row with the same speed and intensity. The boat moves as fast as the rowers pull the paddles. Only the cox is facing the front, while other rowers are actually facing backward when rowing. This, in a way, shows that there exists a strong trust between the rowers and the cox. After continuous rowing, the rowers rapidly feel tired physically and mentally, but they never give up. Whatever problem they have, they keep rowing until they reach the end. During actual rowing, the sun was beating down, the salty wind was blowing hard, and the sweat was running down on the rowers’ faces. The rowing certainly seemed to be a harsh sport, especially for women, because of the sunlight. We asked Eunseul, a freshman in Division of General Studies, whether those tough features of rowing bothered her. She answered that those did not really bother her much, because she was enjoying rowing so much. She not only enjoyed the rowing itself, but also mentioned some other things that she liked. Eunseul also said that the relationship with other rowing members means a lot to her. Since the rowing club is s sports club, people do not pretend here. but show their true selves to others so that the members can really understand each other well. 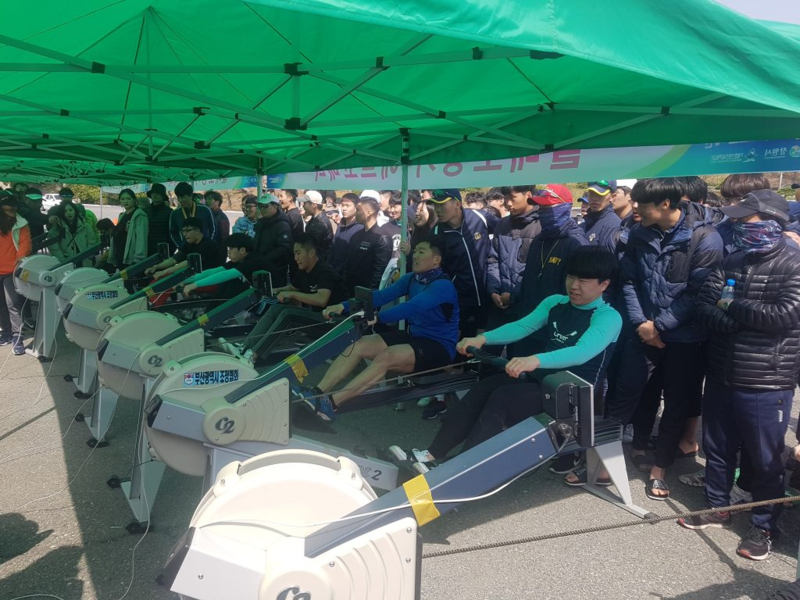 The UNIST rowing team Changwon Okpo Bay, as they prepare for their race on Saturday, April 7, 2018. We asked Jaehyuk Jang, now the captain of UNIST rowing club, whether he thinks that rowing is a difficult sport. His answer was yes and he gave two reasons for it. The first reason was that the rowing is a physically strenuous sport. It requires a lot of stamina and physical strength. Another reason he gave was that rowing requires much cooperation and mental strength. Since several rowers ride in the same boat, cooperation is truly needed to move forward. He also mentioned that it is very tough to control one’s mind when the whole team loses it because a rower makes a mistake. Although he still thought the rowing is a very hard sport, he said that he really wanted to continue rowing if he could. He loved that, after rowing with others, he could feel that people in the same boat could have fellowship and this could make people better understand each other better. In addition, we have interviewed many members of UNIST rowing club on several topics that UNISTARs might be interested in. Q. 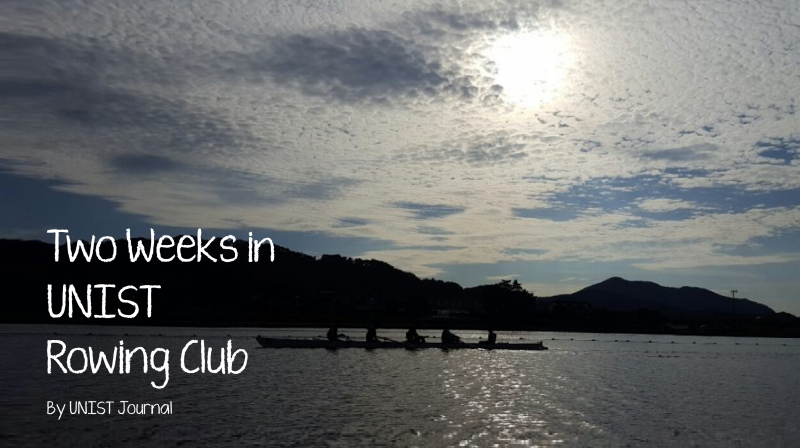 Why did you join Rowing Club? Jihyang: While female members are just managers doing auxiliary roles in other sports club, I thought I would be able to exercise together in Rowing Club. Sungmun: I am a graduate student. I wanted to join a sports club, which can work out with other people. Members are so nice here. Asema: One of my friends already joined this club and strongly recommended it to me. 97% of my country’s territory is covered by mountains. So there is no opportunity to get on a boat there. He said this would be a very special experience and I agree with it. Q. When and what is the hardest point during rowing? Jaehyuk: The moment when the last 300 meters remain before the finish. Haesoo: Once an oar got stuck in the water during a competition. Although all members including myself did our best and we were in the first place, we became the last team passing the finish line due to the mistake. I felt very much upset that time. Boseong: Since the location where we practice the actual rowing is close to the sea, the waves sometimes dash too high. It is a difficult condition for rowing, but it could turn into an advantage. Since our team members are familiar with that condition, we are able to cope in such cases. Minji: I stayed in a training camp last summer. Normally, the only thing we do in a camp is training. However, on one unlucky day, our team coach made us row 10,000 meters with the ergometers. It almost killed me. Q. When do you feel rewarded? Hyeonki: When I won a medal for the first time! Director Kim: Same as Hyeonki. When the rowing club just started, we did not even have a boat. During that time we won several medals in races using the ergometers, but we couldn’t win any in the actual race. Now we have many medals and prizes, but the first medal is still unforgettable. Gyeongchan: When the race is finished, I feel just like ‘we made it’ and, at that moment, all memories about the stress of the competition get quickly forgotten. Q. Do you have any goals you want to achieve? Director Kim: The mooring, our training spot, is really close to the sea. Since the waves are relatively low in the morning, we have to train mostly in the morning. After some time, the waves usually get rough and we quit training. This is why we are trying to get permission from Ulsan council, so that our rowing club can train nearby Seongnam-dong where the water conditions are more appropriate. Furthermore, we expect that this would raise awareness of UNIST students about our rowing club. 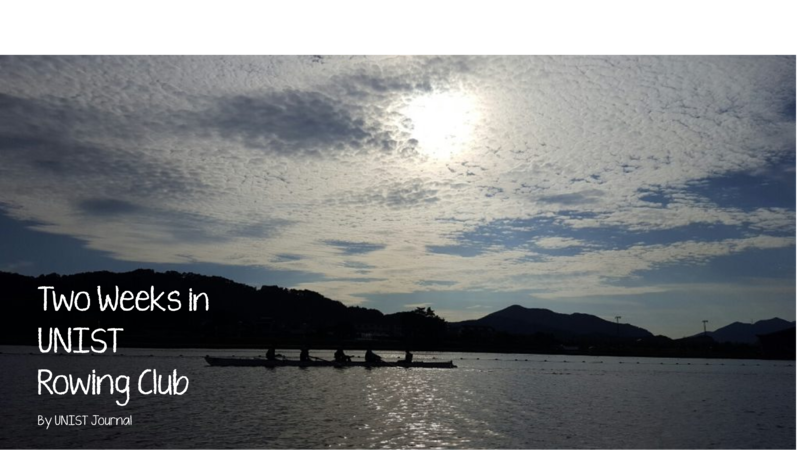 As we experienced rowing for a short time, we surely felt that the rowing is a very attractive sport, as many members of UNIST rowing club said. Although some training sessions were physically challenging and tough, this sport definitely helps to grow a healthier and stronger body. Not only that, people can get to know each other better while training and rowing together. Whenever you see a rowing boat moving against the stream, you would definitely be charmed by the rowing. Through training, rowing, and competitions, people will become rowers who challenge and overcome themselves again and again. 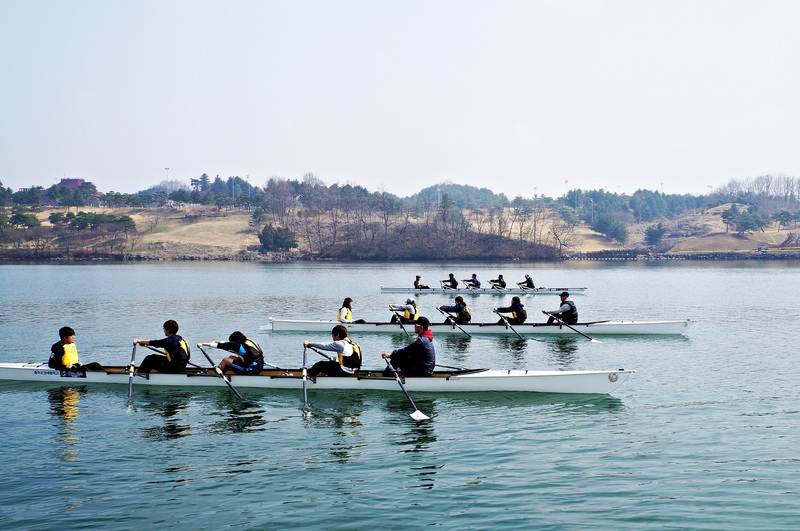 In preparation for the competition this summer, UNIST rowing club is planning to have a training camp in Seoul. If anyone is interested in this amazing sport, become a brave, pioneering rower with our UNIST rowing club. Also, please cheer for our school’s proud rowing club!